When I saw the recipe in my market basket for the first time, I must admit I was skeptical. 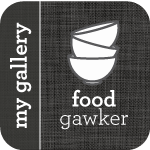 I couldn’t imagine that they would taste good cooked – boy was I wrong. Cooking radishes takes the bite out of them. They are left with a wonderful flavor and an even better texture. You can still taste the water inside of them, as they burst in your mouth. This recipe really took them to another level though. 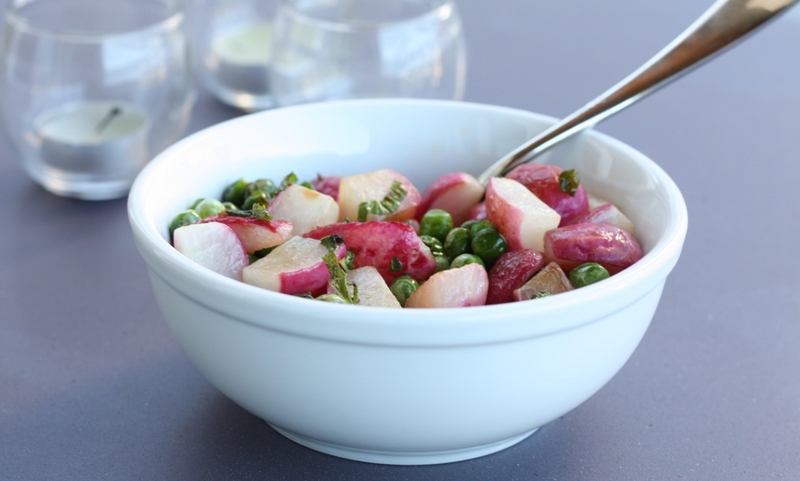 The mint really brought out the deep flavor of the radishes, and because I had some fresh peas to use, and peas are amazing with mint – I thought they would go well. Oh did they ever. I quickly ran outside to photograph since I didn’t want to miss this opportunity. And hey, not only were they delicious, the colors were beautiful. Bonus. Heat oil and butter in a large saute pan over medium heat. Let butter melt and then cook a bit longer, until it’s a deep golden and beginning to take on a nutty smell, about 2 minutes total. 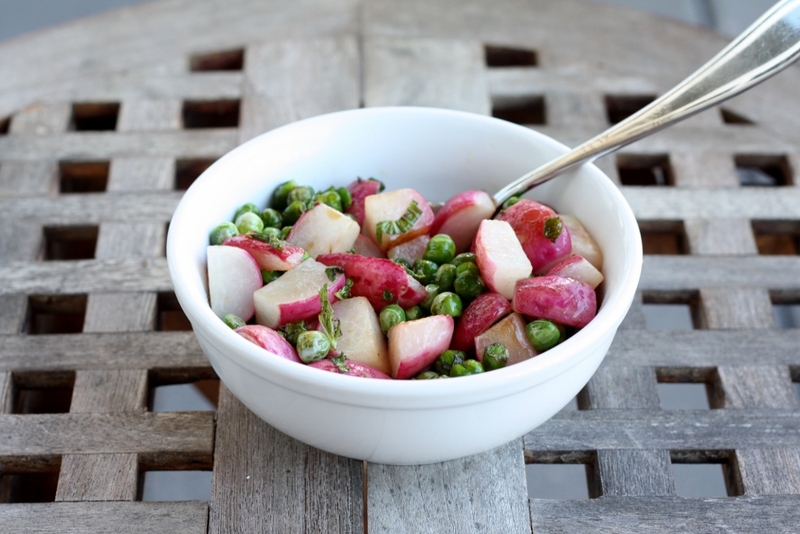 Add radishes and peas to pan and toss to coat. Sprinkle with salt and pepper. Cook for 8-10 minutes, tossing frequently, until radishes are tender and tinged with caramelization in places. Let cool slightly and sprinkle with mint and additional salt to taste. I thought I was the only weird one who like their radishes sauteed. I sometimes add them to stir frys too. Love this little side dish.